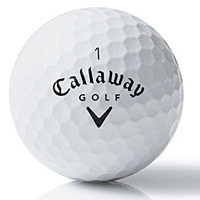 Introduced in December 2014, the new Callaway Chrome Soft takes our top spot for great new innovation for the mid-$30 price point golf ball that delivers exceptional all-a-round performance. The Chrome Soft is a three-piece construction, 65-compression, urethane cover golf ball that feels softer, but delivers maximum distance along with awesome wedge spin and greenside control. The Chrome Soft delivers virtually all of the performance characteristics that the more expensive Titleist premium golf balls deliver, but at a significantly lower cost. All-around performer, softest feel, excellent short game control.